Christian themes scarcely come about in the work of Minne before the First World War. In the period, the artist opted for universal themes, whereby he primarily levied a deeply human emotion and expression on his subjects. Sometimes the artist based his ideas indeed upon Christian themes, for example, in The Prodigal Son, John the Baptist or The Three Women at the Tomb. In 1908, a well-defined group of drawings appeared that stylistically already point towards the paintings that emerged in Wales, and in which the religious thematic more expressively comes to the fore in a number of them. 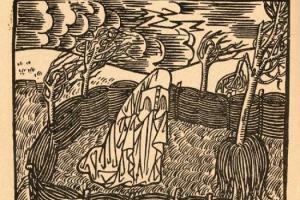 In 1889, Minne illustrated the poetry collection Serres Chaudes by Maurice Maeterlinck. In two of the illustrations we encounter the figure of a cloister inhabitant. 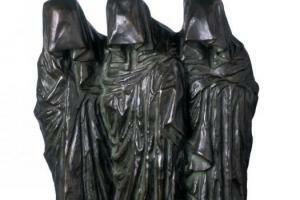 From that year a lesser-known sculpture of an upright standing nun with lightly bowed head also dates. The narrative character of the sculpture has ties with the illustration that Minne makes for the poem, Âme de nuit from Serres Chaudes by Maeterlinck. The bust of Nun Praying from 1894, better known as Oraison, is probably directly inspired by one of the three like-named poems of Maurice Maeterlinck from the same collection. 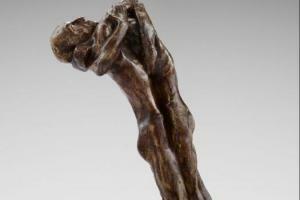 The atmosphere of the humility and disconsolation in the first strophes of the second poem with this name are found again in Minne's sculpture. De mes yeux, les cieux de mon coeur! Ayez pitié de mes misères! Faibles fleurs dans un verre d'eau. The stylising and the emphasis on the graphic make the sculpture closely related to the woodcut that Minne created for Trois petits drames by Maeterlinck. The schematisation of the face and the hands lend the work a pre-expressionist character. 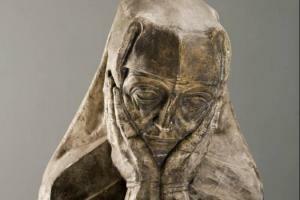 There are various version in plaster, wood and bronze known of the Nun Praying. The Museum of Ghent possesses one version in plaster. The figure of a praying nun also comes to the fore in one of the illustrations that Minne makes for Les villages illusoires by Emile Verhaeren. In a closed garden, a hortus closus, sits a kneeling nun praying, while the storm around her symbolises the seduction from which she shelters herself behind the book. In the kneeling John the Baptist from 1895, Minne takes up again the position of the head and the hands of the Nun Praying. The gesture is one of resignation and despair, rather than one of prayer. On the scroll before him stand the words: Fuit homo missus a deo cui nomen erat Johannes. In the graphic stylising and the rolling play of lines in the hair and in the face of John, we already see the influence of the art nouveau and a certain relationship with Toorop. The sculpture is executed in plaster and bluestone, both in the possession of the Museum of Fine Arts Ghent. For the figure of John the Baptist, Minne made various preparatory studies. Therein we see how the artist develops the different variations of the kneeling youths from the kneeling John. 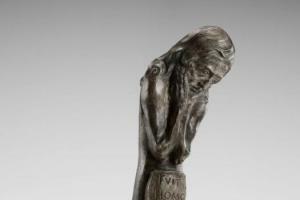 In that same year emerge sketches for the sculpture group Three Holy Women at the Tomb, which Minne also realises and in which he depicts a moment from the Passion of Christ. 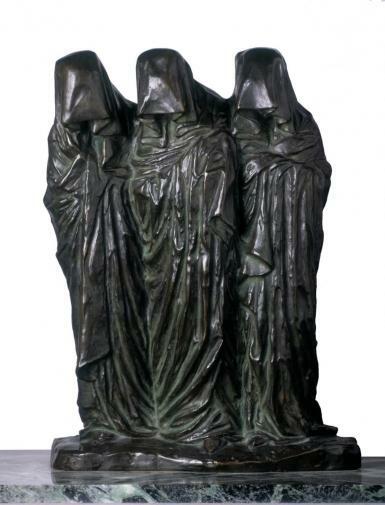 However, through limiting the presentation to the three mourning women, the narrative element falls away and moves rather to the expression of a general, human sadness. The concept hearkens back to the type of medieval pleurants. In addition to various copies in bronze, of which the Groeninge Museum of Bruges has one, a number of versions in plaster and wood are also known. 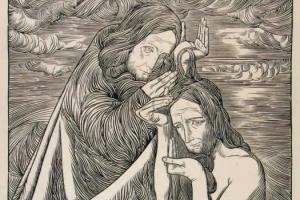 One of the few pre-War works in which Minne expressively depicts a narrative from the Gospels is the woodcut The Baptism of Christ from 1899. The print originally makes up a part of the art folio Germinal that Minne's German friend and mecenas Julius Meier-Graefe published in 1899 and sold in his Paris gallery La Maison Moderne. In 1900, Minne exhibited the print at the Wiener Secession. In Minne's sketchbooks and study sheets from the years 1898-1900, still other religious themes come into play. As such, he is known for, inter alia, sketches for a Stations of the Cross, a bearing of the cross, and a deposition from the cross. His importance at that moment for religious themes probably had to do with his move to Sint-Martens-Latem and with a possible assignment for a Stations of the Cross by the pastor of Wambeke, a man who at that moment played a large role in the religious symbolistic spirit of the First group from Sint-Martens-Latem. It is only during his stay in Wales, however, that Minne will depict in images numerous scenes from the life story of Christ, in particular The Eucharist, the Crucified Christ and the Pietà.